That Jack Ryan: Shadow Recruit is a David Koepp rewrite of a screenplay once doctored by Steve Zaillian portends the inscrutable nature of this reboot of the Tom Clancy spy series. Directed by Kenneth Branagh—who also features as the Ruskie baddie—the film gets mired between its desire to fashion a faithful thriller yet update its titular spy for modern times. The result is a muddled, middling redux that’s more Jack Ryan: Shadow of His Former Self. 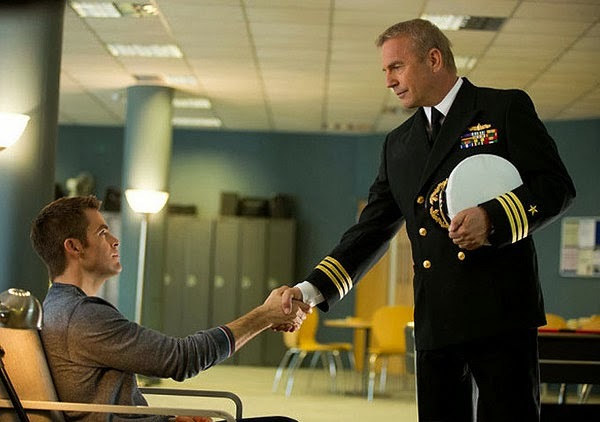 A post-9/11 Army recruit, a chopper crash leaves Jack (Chris Pine) near death and convalescing at Walter Reed under the encouragement of wife-in-waiting Nurse Cathy (Keira Knightley). CIA headhunter Thomas Harper (Kevin Costner) “sees something” in Jack and plucks him from rehab to become a financial analyst. Embedded with a Wall Street firm, Jack is assigned to travel to Moscow and investigate the nefarious financial misdoings of Viktor Cherevin (Branagh), a James Bond-style villain with stage 3 cirrhosis and a weakness for wine and women. Seems the Russians want to crash the world’s financial markets—welcome to 1977. This is the sort of film where untrained good guys outsmart diabolical bad guys for no logical reason beyond narrative progression. The contrivances are laced with shaky cam action sequences staged with the flair of b-roll footage and scored by the Action Muzak 1000. At the center of this distended storyline is Pine, whose charmless Jack Ryan is a far cry from the portrayal of Alec Baldwin and Harrison Ford. A couple of scenes hint at the gritty thriller this could have been: a brutal brawl between Jack and an assassin in a hotel washroom, and when Viktor kidnaps Cathy and threatens to explode a light bulb inside her mouth. Alas, those moments of intrigue prove as fleeting as Knightley’s irregular American accent.